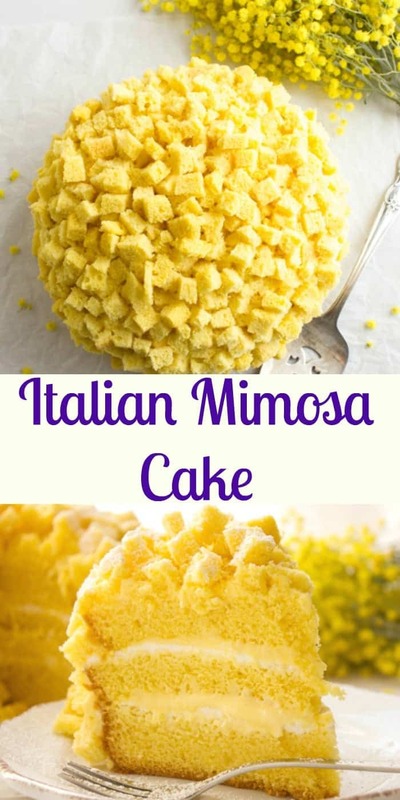 An Italian Mimosa Cake is not only pretty to look at but really delicious to eat. This Cake isn’t just any cake it was made to honour women on March 8th for International Women’s Day. The first International Women’s Day was celebrated on March 8, 1946. 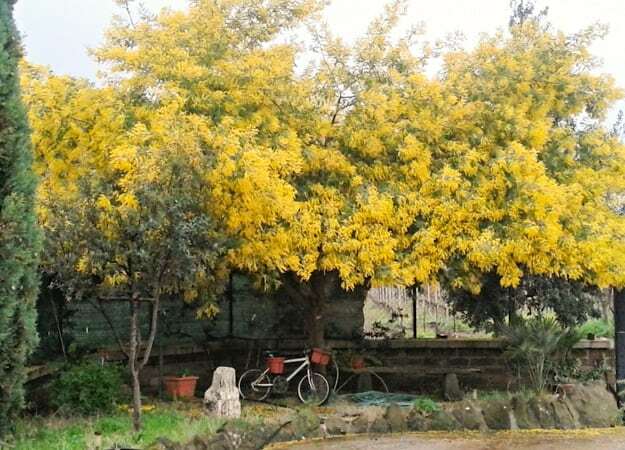 The Mimosa was chosen by the “Italian Women Association” probably because of the beautiful yellow flowers and the fact that the flower blooms in the beginning of March in Central Italy. 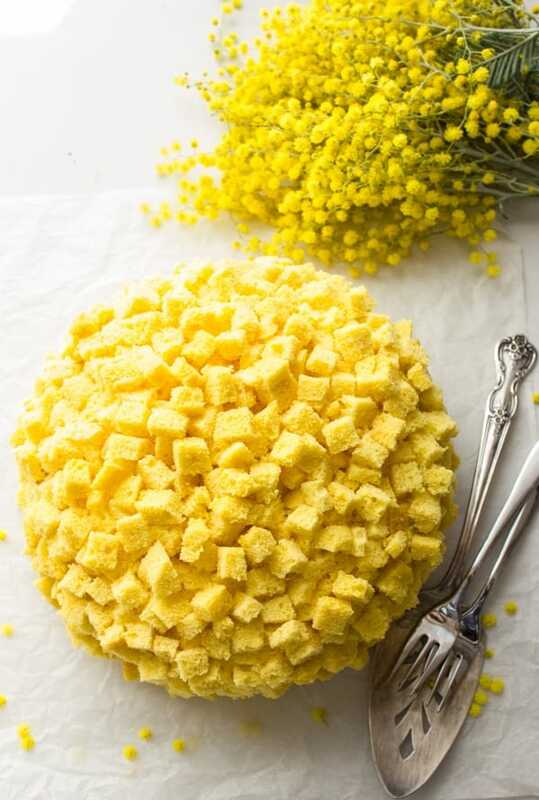 Most believe it was a Roman Female Pastry Chef that invented the Mimosa Cake, she cut up pieces of the cake and sprinkled them on the cake’s surface in an attempt to produce the Mimosa flower. On this day women / girls are given a small bouquet of Mimosa flowers. Yes even the Italian will give me a small bouquet of Mimosa flowers, but as he says, he also gave me a tree, and a glorious beautiful tree it is. To tell the truth I adore that tree but the smell of the flower not so much. I think you have to have a nose for it, my daughters love it. 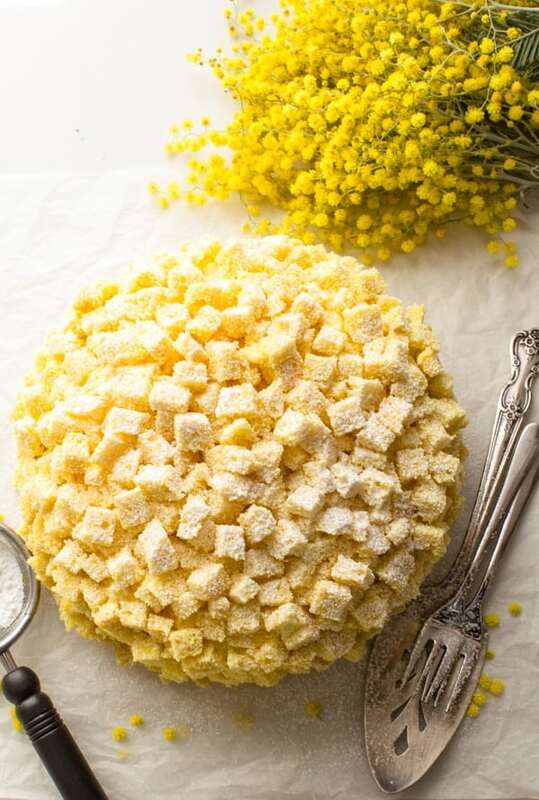 The Mimosa cake is not a difficult cake to make at all, just a little bit of patience and time and the process of making it becomes fun. 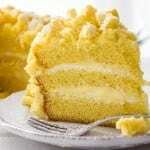 Don’t let the bright yellow colour scare you, there is not a drop of food colouring in this cake. 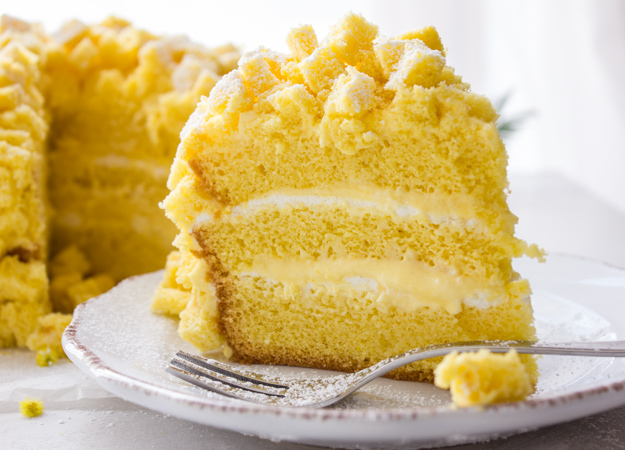 The brightness of the cake comes from the type of eggs that are used. The colour of the yolk depends on what the hen eats, it can go from very pale to a very bright yellow. 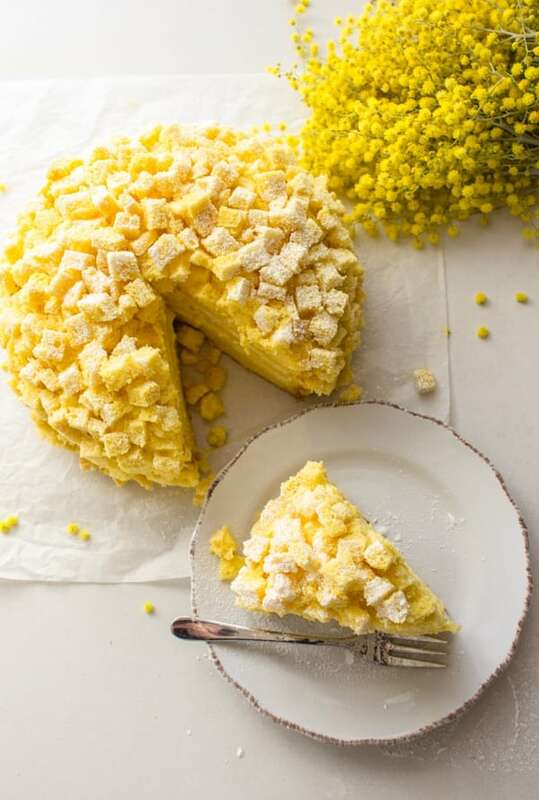 So if you have the urge to celebrate International Women’s Day like the Italians or just because it seems like a good day to eat an amazing cake, then this Pretty Italian Mimosa Cake is for you. Enjoy! 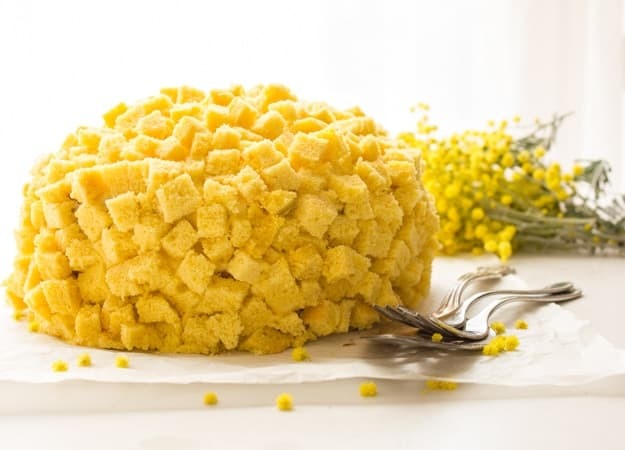 Italian Mimosa Cake, a delicious sponge cake, layers of an Italian Special cream, a classic Italian cake, a delicate creamy dessert recipe. Pre-heat oven to 350° (180° celsius), lightly grease and flour a 7 x 3 inch (18 x 7 1/2 centimeter) round springform cake pan and an 8 inch (20 centimeter) round cake pan. 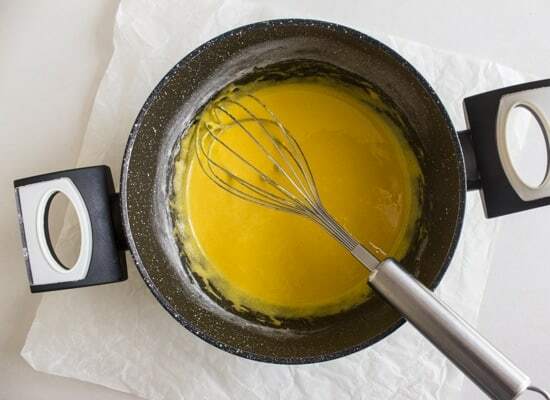 Beat on medium-low speed eggs and sugar until well mixed (1-2 minutes) add flour and baking powder and continue to beat on medium speed for 2-3 minutes or until smooth. Pour into greased cake pans and bake for approximately 30 minutes or until tooth pick comes out clean and dry. Let cake cool completely. 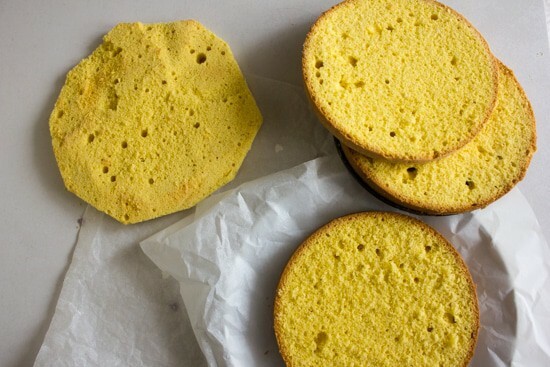 Remove the top from the 7 inch cake to make a flat surface (do not toss the cut cake**) then slice cake in 3 layers (set aside),remove the golden crust parts from the top and sides of the 8 inch cake (again do not toss**), then cut into 2 layers and cut each layer into long narrow strips and cut the strips into small square pieces (see photos) set aside. 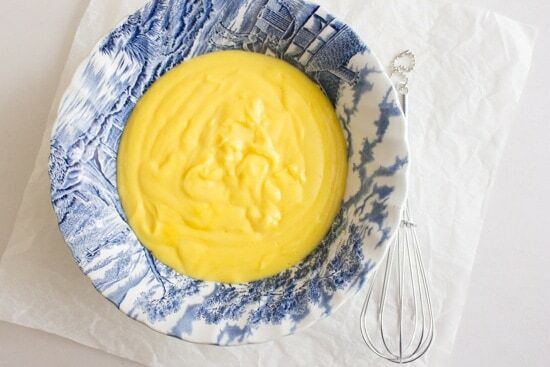 In a medium pot add yolks and sugar, whisk together until combined, then add flour and vanilla, place pot over low heat, add warm milk/cream, whisking continuously until thickened. Remove to a glass bowl, cover with plastic wrap (make sure wrap touches the cream mixture) and refrigerate at least 3 hours. 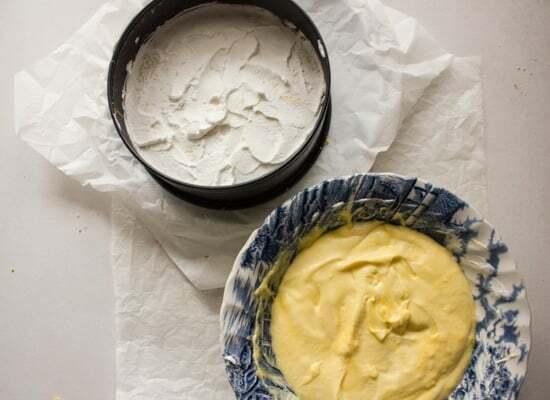 In a medium bowl beat until stiff whipping cream (or whole cream) and powdered/icing sugar. 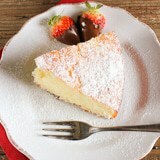 To make it easier to assemble place the first layer of cake back into the spring form pan, spread half the Whipped Cream Filling and approximately 1/4 of the Italian Cream Filling on top, place the 2nd layer on top and repeat with fillings, top with third layer and cover the cake with the remaining Italian Cream Filling. Cover the frosted cake with the small pieces of cake, refrigerate for at least 4-5 hours, overnight is even better. Dust with powdered/icing sugar before serving if desired. Enjoy! **Place leftover cake in a plastic bag and free until needed, next week I will have a delicious coffee cake with a crumb topping using this leftover cake. 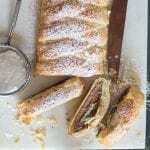 Looking for other delicious desserts, I think you will like these too! I’m afraid I have disappointing news. I tried to make this cake and it did not turn out well. As soon as I started adding all the flour the recipe called for it seemed way too much. I don’t think the wet ingredients needed more than one cup of flour to ensure the batter is light and spongy despite the baking powder amounts. I did follow the recipe nevertheless and the cake came out as dense as a brick. On a positive note, the pastry cream was delightful and delicious. Just wanted to pass the feedback. 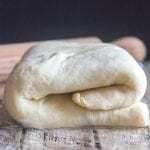 As always thank you for sharing your recipes; I am a fan of your blog! Hi Maria, thanks for letting me know, when I get back to Italy I am going to remake it and test it out. Well at least the cream filling worked :). So glad you are a fan. Have a great weekend. This cake looks beautiful and I’m sure it tastes even better. 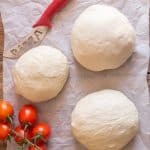 My husband and I belong to an Italian cooking group (LaCucina) that meets monthly. I plan on making this dessert for our meeting this Saturday. Do I use sweet or salted butter? Do I fill both cake pans evenly? Can I make this dessert the day before? Hi Lorie, the group must be so much fun. I used just regular butter (unsalted is really hard to find in Italy). 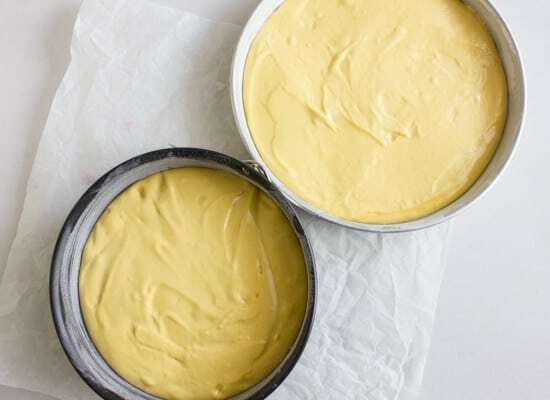 Fill one of the pans a little more to make a higher cake so you can slice it in 3 levels. It is best to make it the day before,and let it sit overnight in the fridge tastes better. Let me know how it goes. Have fun. 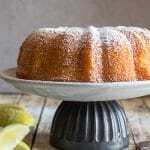 Do you use a size larger spring form pan to assemble the cake? (I just can’t figure how you are able to place the cake “flowers” on the sides of the cake without using a larger-sized spring form pan.) I think I was supposed to be born Italian because I’m drawn to your desserts! It looks so beautiful. I would try to make one . 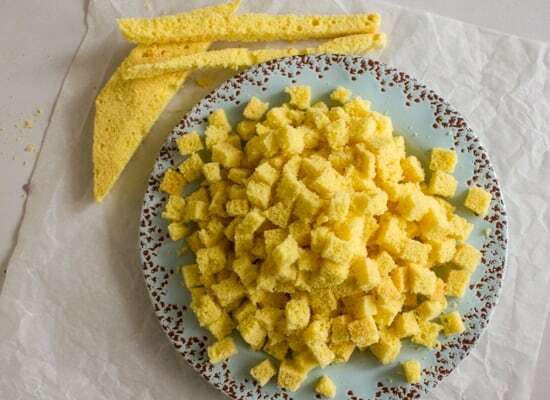 Could you tell me how much butter or vegetable oil needed for this sponge cake? 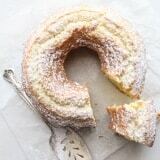 Hi Sue, there is no oil or butter in an Italian Sponge cake, just 4 ingredients, nice and easy. Hope you enjoy it. Simply beautiful! What a wonderful story.